My dads friend went to visit his childhood home earlier this week and took some photos. 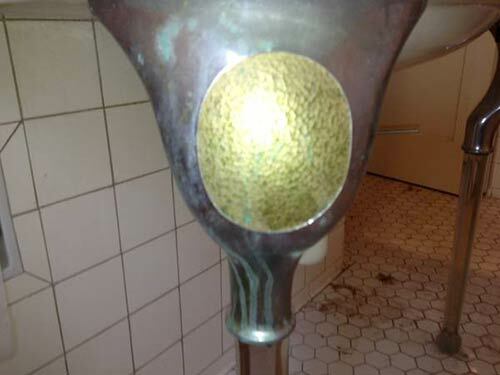 This sink caught my attention… I’ve never seen one like this before! 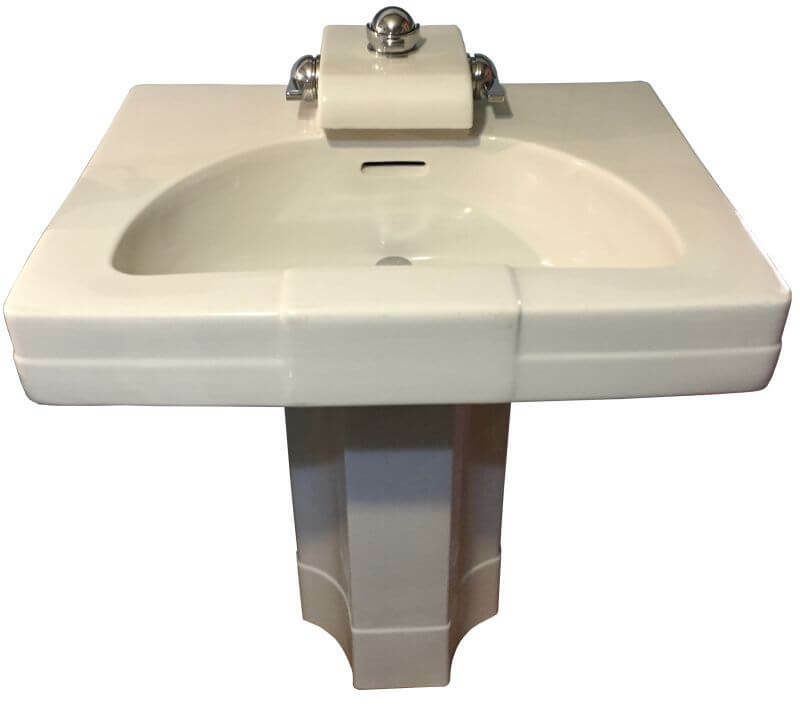 It is all one unit, sink plus counter! Love it!!!!! And the decorative tile, sooo cute! Thank you, Sarah! Our first woddity of the year! 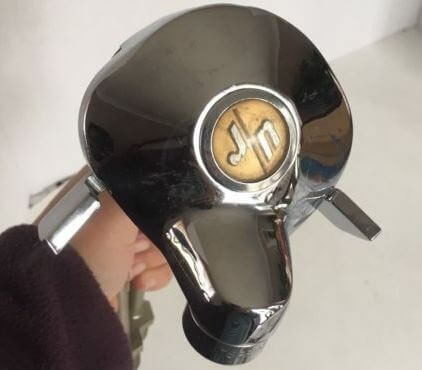 Can anyone identify the maker and the year? I’m thing early 1980s by the look of that pedestal base… And maybe the whole counter top thingie is designed with the idea that it would span the top of an adjacent toilet? All kind of clever if you ask me. You can almost never have to much easy-to-clean counter top space in a bathroom near the sink. 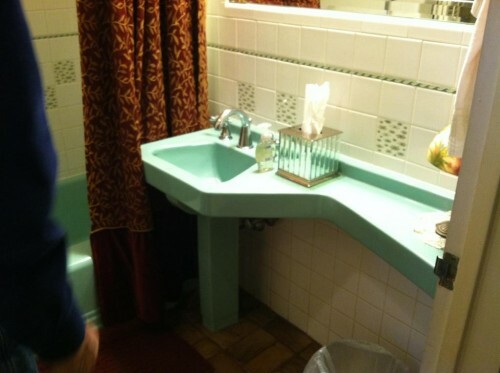 Readers, have you ever seen a sink like this before? What year do you think it’s from? That is a very cool sink! 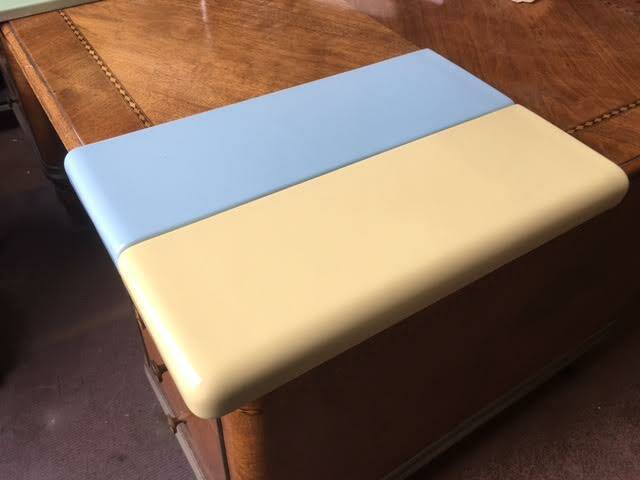 I vote anywhere from 1940-1960, based on color and tub design, and if I really had to narrow it down, I’d say late 40’s to early 50’s, the heyday of colors and ingenuity in bathroom designs (think Cinderella tubs!)….. Great find, and good on Sarah for snapping photos for the woddity museum! I like the invisible tissue box. Oh no that sink is original to the house! 1958! Looks like Tappan Trailer Tami takes the prize for guessing the correct vintage! The tile is in such nice condition, I never would have guessed its age as the same as the sink and tub. Great bathroom overall! I lived in an apartment with a 1970’s-era bathroom, and the laminate vanity top extended, in a narrower strip, over the the toilet. To those wondering, the trick is that there was a hidden hinge underneath, and that portion flipped up to allow access to the toilet innards! The laminate had a swirly pattern, and the seam was not noticeable. In all, I found the arrangement really convenient. More problematic was that the mirror covered the entire wall behind the vanity and toilet–great for me, but my husband found it disconcerting to watch himself pee. That’s funny, I think the mirror behind the toilet is strange. Thanks for explaining the access to the toilet tank under the laminated counter. Like Jay, I too say thanks for explaining that. I never noticed it at my aunt’s house. Perhaps they were not all installed that way, but I thought it was really clever that that one was.